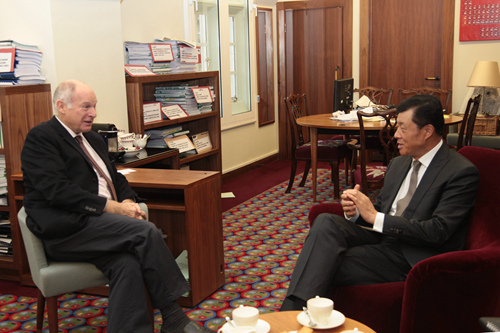 On 21 November, Chinese Ambassador Liu Xiaoming visited Lord Neuberger, the President of the Supreme Court of the UK. He exchanged views with his host on strengthening legal exchanges and cooperation between China and the UK. Ambassador Liu noted that expanding China-UK legal exchanges in recent years have substantiated bilateral cooperation and contributed to the growth of the bilateral ties. He briefed his host on the recently concluded Fourth Plenary Session of the 18th Central Committee of the Communist Party of China, where decision was adopted on the comprehensive advancement of rule of law. The meeting emphasized that China will follow the path of the socialist rule of law with Chinese characteristics, improve the legal system with the Constitution at the core, promote law-based administration, enhance public awareness of rule of law and build a strong legal profession. The efforts to enhance rule of law presents important opportunities for China and the UK to learn from each other based on mutual respect and equality. China welcomes a visit by Lord Neuberger in due course to witness the country's huge economic and social progress as well as rule of law. Lord Neuberger admired China's great achievements since the reform and opening up, commended China's pursuit of the rule of law that suits its national reality and expressed his support for China and the UK to seek common ground while reserving differences and learn from each other in the legal areas. He looks forward to visiting China soon to see for himself rule of law in China and strengthen exchanges with China' judicial circles.